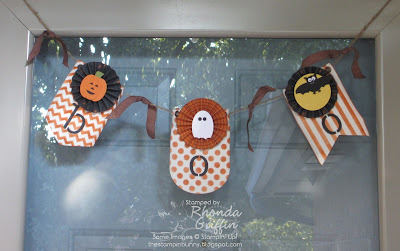 I wanted a small Halloween banner for my door on Halloween night especially, so I used just these letters for my banner. 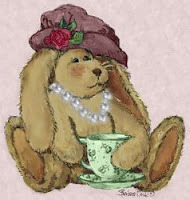 I like the punch art sillies that make the banner lean toward the funny side rather than scary. This will be a class option if anyone is interested. We'll make the banner in an evening (Thursday, September 26), and it will be $15...You could also choose to make a "spooky" lettered banner instead for $25 that uses the Halloween Banner Accessory Kit on page 31 of the holiday catalog. 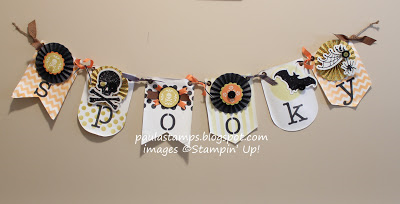 Here's a picture of my friend Paula Wright's adorable Spooky banner as shown on her blog here: http://paulastamps.blogspot.com/2013/08/build-banner-tips-and-tricks.html Yours can be this style if you choose the $25 option.